The poker community is ready to help. Donor matches @RGPokerSeries efforts to help troops. For Gordon Peet (photo), joining the Army was the best thing to happen in his life. As a paratrooper, jumping out of a plane was a thrill. While stationed in Alaska, his unit was deployed to Iraq in 2006 for 15 months. While stationed in North Carolina and coming up on his last year of service, one of his units was deploying to Afghanistan. The paratrooper answered the call and volunteered to go, spending his last year in the country. With months and months stationed overseas, Peet knows first-hand what the long hours away from home and family are like. But just small deliveries from family and thoughtful Americans always meant a lot. “To get care packages while overseas, especially in combat, words cannot describe the feeling of gratitude,” he says. “They mean the absolute world to us over there; it's like having a piece of home with you. It’s that kind of situation that Tana Karn, founder of the RunGood Poker Series, hopes his tour’s partnership with Operation Gratitude can help. At its stop last week at the Horseshoe Casino in Bossier City, La., the effort was in full effect in its mission to support U.S. service members worldwide. For every limited edition RunGood USA hat awarded or sold (including upcoming stops in Tunica, Miss., and Joplin, Mo. ), the company will send out a RunGood Care Kit and Operation Gratitude Care Package. At final tables this season, the RunGood Poker Series will award ten hats which will also send ten care kits out. Care kits will be gathered and hand delivered along with funds for shipping to join awaiting care packages going out at the end of the season. The idea for a charitable cause each season came about in 2015 when the tour held its national championship in New Orleans. Several Houston players showed up to play, and Karn said he got to know several of them. When Hurricane Harvey hit the Texas coast last year, RunGodd pros Mina Greco and Ray Henson updated him on their efforts to help friends in the area. Karn said “it hit home” because so many Houston players had supported the RGPS. The tour jumped in to help; offering all of their sales for a week to hurricane relief. The effort raised $4,500, and Karn decided those charitable efforts should continue with the tour. Operation Gratitude soon became a partner – and seemed a perfect fit. Those items are then added to a bigger care package with items ranging from magazines, socks, hand sanitizer, hand warmers, flashlight, and more. Each kit also contains a note from the person who assembled the kit and bought the sponsoring hat. RunGood’s initial goal was to send 500 kits this season. However, an anonymous donor has come forward at the start of the Horseshoe-Bossier City event to match each kit sent out. Now every hat awarded or sold will send two care kits to soldiers, and the tour organizers hope to send 1,000 now. Certainly, Peet knows the need for these efforts first-hand. Born in El Paso, he moved to the Houston area at age 12. He graduated from high school at 16, and after one semester at Sam Houston State University he decided to join the Army. His father had also been in the Army and served in Vietnam. In February of 2005, he shipped off to basic training in Fort Benning, Ga.
Now that he’s a civilian, Peet has become a bit of a poker player also. After returning home in 2011, he picked the game up playing at bars and free poker leagues. He even jumped into two events at the RunGood Bossier City stops. Peet vividly remembers receiving packages when stationed overseas and how good it felt to connect with home. No doubt others receiving their kits will feel the same – probably some of them dealing some Texas Hold’em with those playing cards. For Peet, the efforts mean a lot. 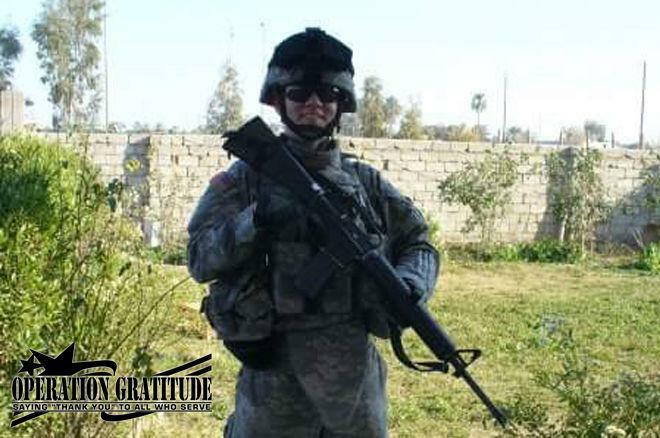 “I want to add how grateful I am of RunGood and Operation Gratitude,” he says. “For RunGood to team up with them is amazing, and I know first-hand that the service members who receive those packages will be extremely happy. Sean Chaffin is a freelance writer in Dallas, Texas, and the host of the PokerNews Podcasting Network's newest podcast True Gambling Stories. To listen, click here.